Sydney: Police are searching for a man who fired a shot into a crowded Indian restaurant in Sydney’s west on August 25, media reports said. A single shot was fired into the front window of Billu’s Indian Eatery on Wigram Street at Harris Park, shortly before 9:00 m on Tuesday, the ABC reported. Nobody was injured in the attach that occurred just before 9:00 pm on Tuesday, August 25. There were about 40 diners at the time of the incident. Inspector Adam Phillips said the bullet was blocked by a metal shelf. “The frightening thing with this is that the shot that was fired … was in a particular part of the restaurant which was extremely busy,” he said, calling the public to assist in identifying the criminal. The ABC report quoting Inspector Phillips also said the alleged gunman, wearing a light blue hoodie, knocked a woman to the ground as he fled along Wigram Street. Restaurant owner Billu said he had no idea why someone would target his restaurant. However, he said it was the third such incident in the area in four months and local restaurants were concerned it would scare off diners. NSW Federation of Indian Associations president Dr Yadu Singh, who is also a friend of the owner, said it was a possibility the shooting could be part of an extortion attempt, the ABC said. 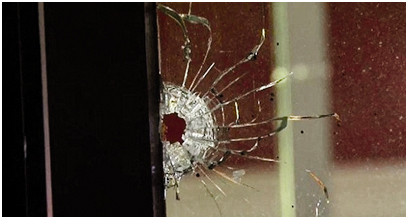 Meanwhile, a mother of three has described how a bullet fired through the front window of the restaurant narrowly missed her family, News reported. “It (the gunshot) was close to me, my husband and (a) worker,” said Sara Limbu, who was at the restaurant with her husband and children to pick up takeaway. Mrs. Limbu, a regular customer at Billu’s, says she’s scared to go back.